Plans for a Lighthouse Service 10-inch whistle, from the 1902 Instructions to Light-Keepers. Although it was an official government installation intended to guide ships safely through the Straits of Mackinac, the Old Mackinac Point Light Station was also home to several families, complete with pets and children. Between 1890 and 1957, several kids lived at the station, each experiencing and sometimes helping with the daily routine of operating a Great Lakes lighthouse. Olsens- Keeper Henrik Olsen with his wife, Nila, and their sons Ray and Bruce. Keeper James Marshall poses with his three children sometime around 1930. They are proudly displaying the “Efficiency” flag awarded to Old Mackinac Point. Chester Marshall and Delcie, daughter of his sister Ethel, play outside on the station grounds in 1916. Many lighthouses around the Great Lakes were home to dedicated light keepers and their families, some of whom served at the same stations for years. At Old Mackinac Point Lighthouse, tending the light station became a family affair, with members of the Marshall family living and working at the lighthouse for 50 years. On this day in 1890, Keeper George Marshall sounded the fog signal at the Old Mackinac Point Light Station for the very first time. This first blast of the fog whistle signaled the completion of a project begun a year earlier. 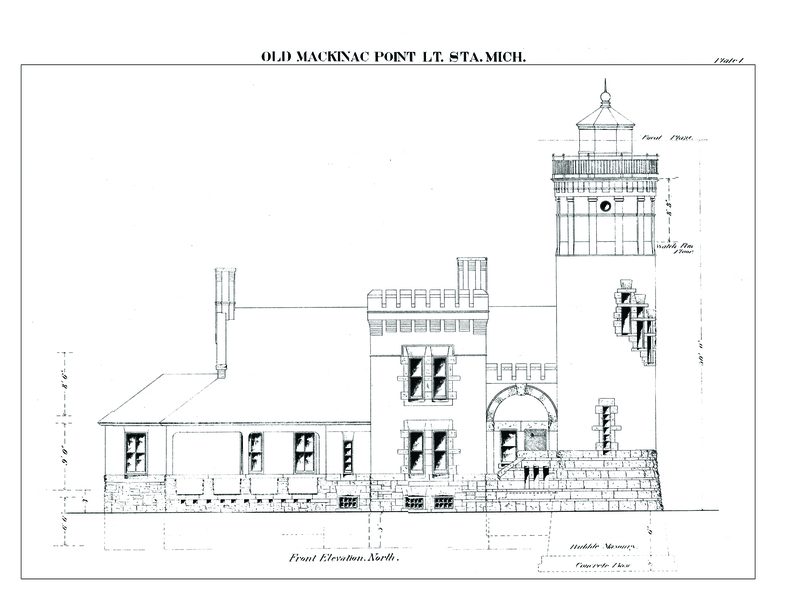 In March 1889, Congress passed two acts regarding the creation of a light station at Old Mackinac Point. The first formally established the Old Mackinac Point Light Station, while the second appropriated $5,500 for the construction of a fog signal. This photograph from the early 1900s shows Old Mackinac Point Lighthouse and the fog signal building. The inset image shows the two steam whistles next to the boiler vent stacks. The fog signal sounded on November 5, 1890 was mounted on a 20’ by 40’ corrugated iron building. Inside, two identical steam boilers and associated machinery powered 10” steam whistles, which were mounted above the roof of the building. Although only one boiler and whistle were used at a time, keepers maintained the second set of machinery as a backup system. To help sailors identify the Old Mackinac Point fog signal, the fog whistles automatically sounded in a unique pattern: a 5-second blast, followed by 17 seconds of silence, followed by another 5-second blast, followed by 33 seconds of silence. Other light stations sounded their own unique whistle signatures. 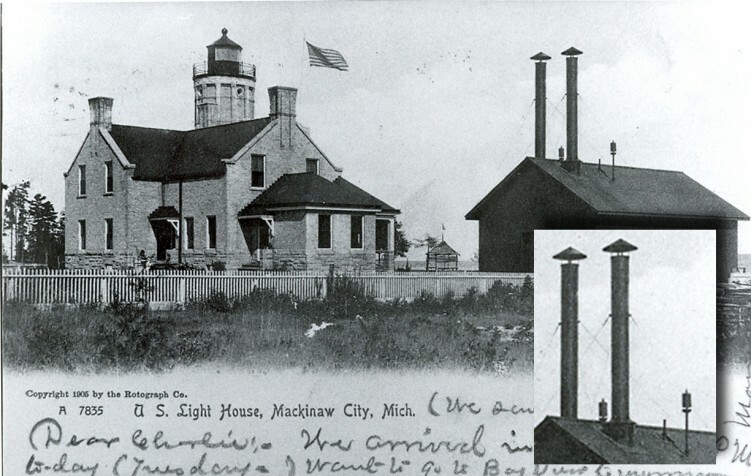 The U.S. Lighthouse Service replaced the original 1890 fog signal building with a brick structure in 1907. New boilers and whistles were installed in this building. The fog whistles at Old Mackinac Point may have sounded like this: Click here to listen to a steam whistle. The fog whistles themselves were replaced by air horns in the 1930s. Click here to listen to the fog horns at Old Mackinac Point Click here to hear it. Click here for more information or to purchase a copy of one of Mackinac State Historic Parks‘ Old Mackinac Point Lighthouse publications.